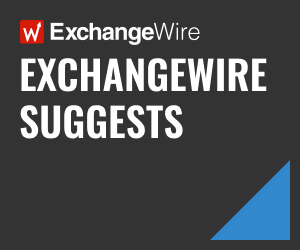 In this weekly segment, ExchangeWire sums up key industry updates on ad tech from around the Asia-Pacific region – and in this edition: Indonesia & Philippines Amongst Top 10 New Ad Spend Contributors; Strong Online Ad Sales Drive Tencent’s 2017 Earnings; Singapore Advertiser Group Offers Programmatic Guide; and China Millennials Most Receptive to Short Video Ads. 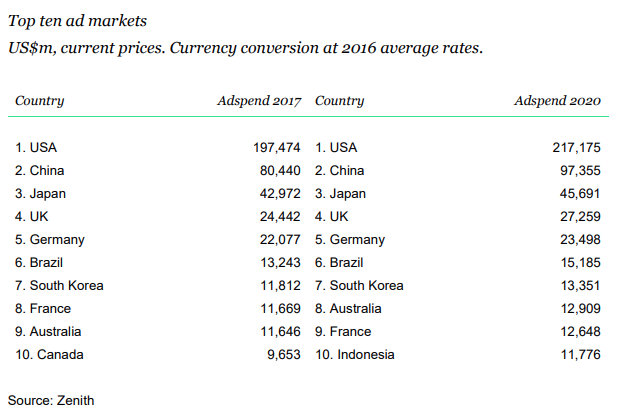 Indonesia, South Korea, and the Philippines are amongst the world’s 10 biggest contributors of new ad dollars over the next three years, which also includes China and India. China, in fact, would be the second-largest contributor of new ad spend between 2017 and 2020, accounting for 22% of the total figure and behind the U.S., which would account for 26%. Indonesia, India, Japan, and the UK would contribute 4% each over the forecast period, according to Zenith’s latest quarterly ad expenditure projections. 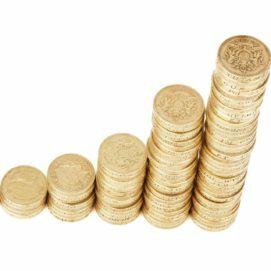 It added that global ad dollars would climb by USD$77bn (£55.58bn) over the next three years, with 2018 projected to see a 4.6% growth to reach USD$579bn (£417.92bn) by year end. This was an upward revision from Zenith’s previous growth forecast of 4.1%, which it attributed to surprise upticks in several markets – specifically, China, the Philippines, Argentina, and Ireland. Advertisers also were projected to spend 40.2% of their budgets online in 2018, compared to 37.6% last year and 34.3% in 2016. Growth here was fuelled primarily by digital transformation, where advertisers were investing in technology and data to enhance their relationships with consumers. Online ads climbed 13.7% last year to hit USD$204bn (£147.25bn) and were expected to account for 40.2% of overall online ad spend this year, before increasing to 44.6% in 2020. In fact, online ads last year already accounted for more than 55% of ad spend in China, Sweden, and the UK. Tencent has reported a 49% year-on-year growth in online advertising revenue for its fiscal 2017, reaching ¥40.44bn (£4.61bn). Online ad revenue contributed 17% of the Chinese internet giant’s total revenue for the year, with ad sales from its social and other platforms climbing 65% to hit ¥25.61bn (£2.92bn). Media ad revenue climbed 30% to ¥14.83bn (£1.69bn), driven by higher traffic and revenue from the company’s Tencent Video and other video streaming services. Its strong ad sales helped Tencent clock a 75% growth in profit to ¥72.47bn (£8.26bn) for the year, where it also saw strong revenue growth from its value-added services. These encompassed the company’s messaging apps including WeChat and online games. This business unit reported a 43% climb in revenue to ¥154bn (£17.56bn) and accounted for 65% of Tencent’s total revenue. The Chinese vendor saw its overall 2017 revenue climb 56% to reach ¥237.76bn (£27.1bn). Singapore Advertisers Association (SAA) has released a guidebook to help local marketers better understand the digital environment and programmatic advertising. 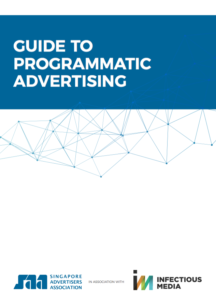 Created through a partnership with Infectious Media, the Guide to Programmatic Advertising was touted to offer an overview of the market and tips on developing effective digital strategies. It also highlighted challenges marketers would face across various aspects, such as in-house programmatic, viewability, ad blocking, brand safety, fraud, and ad measurement. According to SAA, many marketers had struggled to maintain the necessary knowledge and understanding of programmatic advertising, which had led to “millions in wasted ad spend” and lack of transparency. It noted that these issues currently were holding back the market. SAA’s president and StarHub’s vice president of brand and marketing communications, Oliver Chong, said: “In today’s complex and evolving digital marketing landscape, there are many tools and solutions available to help marketers achieve their business goals. Programmatic is one of them. “It is also important to highlight to our members that, whilst programmatic is a powerful tool, there are challenges they need to be aware of, for example, ad fraud, brand safety, and media transparency”, Chong said. More than 72% of Sina Weibo users, born after 1995, in China react positively towards ads on social media. In particular, 57.4% were most receptive to short-form video ads, according to local research firm iResearch Consulting, which polled 1,574 consumers of the Chinese microblogging platform who were born post-1995. Some 35.6% were receptive to ads based on specific topics, while 24% felt likewise with in-stream video ads. The study also found that 27.2% disliked ads on social media platforms, said iResearch, adding that interactive ads that were personalised were more likely to appeal to consumers in this age category.